Despite a slight slowdown, there's considerable cash already sloshing around the biotech IPO space. There's (still!) plenty more stacked up in investor suitcases from California to the New York Island just waiting to back anything with a pulse. The momentum is here! This land grab is your land grab! All of which should mean that biotech boards weighing exit options the past year or so have had choices that didn't exist for most companies in the preceding four or five years. Remember the lean times? The doldrums? You don't? That revived optionality should translate into fewer companies agreeing to pharma takeovers. For the ones that do opt for the warm embrace of a bigger drug company, it should also translate into leverage. Those biopharma start-ups that choose to pull the M&A exit cord should be driving better bargains. But data we compiled from Strategic Transactions suggests neither is true. At least not yet. It's worth remembering that even during the coldest days of the Biotech Winter, when asset prices were at their most depressed, pharma companies flush with cash didn't really go on a shopping spree. 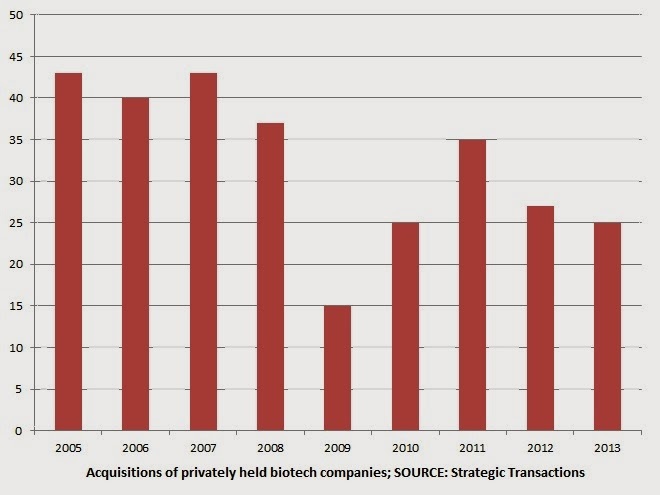 Volume of private biotech M&A never really spiked. We reported that in 2009, and it pretty much held true the next few years. Why? Assets were cheap, but pharma was picky. Prices slackened a bit, and it won't be surprising if they tick up now as biotech booms (despite this week's hiccup among the larger issues). But volume has stayed fairly constant. In fact, the roughly two dozen private biotech M&A deals from 2013, compared with the past five years or so decade of data, slots in at just about average. Part of this might be due to company building strategies, born or embraced in the lean years, that emphasized capital efficiency, single-asset structures and baked-in-buyouts. Those were good ideas for the lean years, and they're still good ideas for these times-o-plenty. Now, what about prices? Data is of course limited; not every acquired company discloses a price tag, and absolute values tend to be worthless unless you know how much money went into the target prior to a deal. 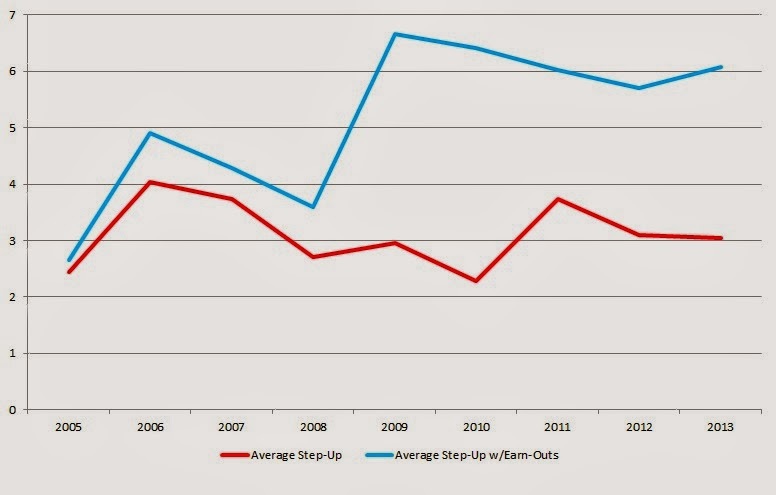 Instead, we looked at step-up multiples, and by-and-large, those haven't changed much either. Instead, up-front deal values on average have bounced around the 3x line for quite a while, and that's roughly in line with, and perhaps a a bit better than, the average pre-money to post-money step-ups we've seen in the biotech IPO space. But acquisition multiples are where we've heard, anecdotally, that things may be changing. So long as biotechs have the kind of optionality that public investors provide - i.e. not just getting onto the market but raising enough cash to have a credible alternative to a pharma partnering deal or outright acquisition - those upfronts might start sliding up. Or perhaps, instead, biobucks that are locked-up in earn-out payments will become easier to attain.